Dave Sanderson is the Founder and President of Dave Sanderson International, based in Charlotte, NC. On January 15, 2009, in New York's freezing Hudson River following a bird strike-induced loss of both engines. 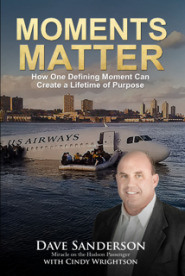 Dave was one of the 155 passengers, one of the last passengers off flight 1549 - known today as "The Miracle on the Hudson" and was largely responsible for making certain others made it out safely. Dave is a man whose faith has been tested in an extreme crisis. God has given him the gift and passion to connect his experience with the lives of countless individuals across the world. I am grateful for his witness, and for the encouragement and wisdom he offers in these pages.